There are two ways that man looks at violence. The first is a glorified lie. The second is the hideous truth and leaves us wondering, if man is capable of causing such horror, how can violence be glorified in the first place? The first rule for survival when you're a child soldier carrying an AK-47 is kill or be killed. But after you look at the blood of your first victim you realize two things: One, you hate yourself. And two: there is no turning back. 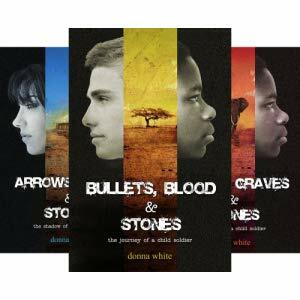 "Donna White has written a book about one of the world's biggest injustices, the issue of child soldiers. An issue that's often hard to understand and tell, she ... give(s) voice to the children who have and continue to be haunted by this experience and at the same time connecting young people in North America to the humanity of their peers on the other side of the world." 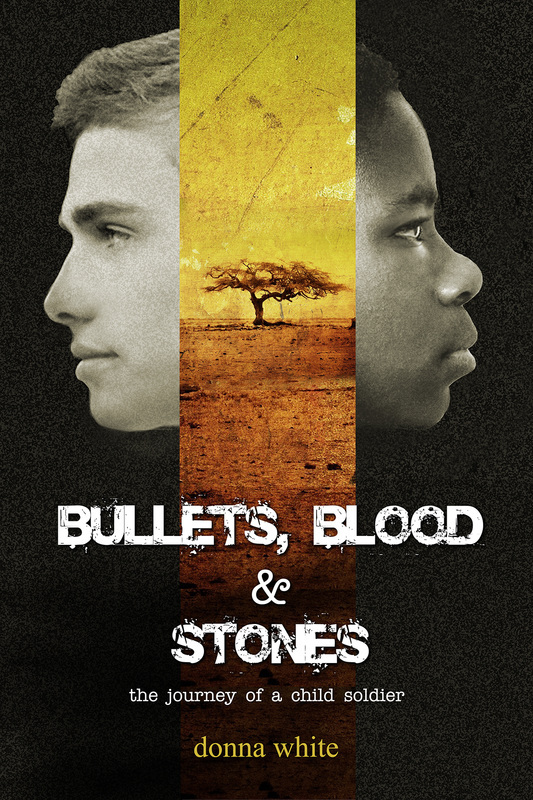 - Michel Chikwanine, former child soldier and author of "Child Soldier: When Boys and Girls are used in War"
"Bullets, Blood and Stones, imaginatively brings the Child Soldier issue to life—bridging the gap between here and there, between us and them in a compelling fashion that will appeal to young readers and adults alike." “Donna White has written a book about one of the most powerful and troubling subjects there is in the modern world: child soldiers. She has also added a supernatural element which makes the book even more accessible to teenagers of all socio-economic backgrounds. This is an important book. Read it. Now.” - David Henry Sterry, best-selling author of "Chicken"
​Charlie looked at Fire, then to the burning logs, and back to her again. Finally, he spoke. Fire glanced at Charlie and sighed. Charlie has much to fear since escaping the Lord’s Resistance Army. If recaptured by Joseph Kony, he faces torture and death at the hands of his fellow soldiers. If he returns to his own village, many will seek revenge at the end of a hangman’s rope for killing and maiming his own people. But it is the ajiji he fears most—the haunting flashbacks and tormented nightmares of the evil deeds he has committed. When he meets Fire, the village witch doctor, Charlie sets out on a journey where he must learn to face the sun and leave the shadows of his past behind him. But many secrets can’t be revealed. And Fire, a beautiful young girl who has recently escaped from the LRA, holds the darkest secret of them all. For twenty-three years, Joseph Kony, leader of the Lord’s Resistance Army, abducted more than sixty thousand children, forcing them to be soldiers in his war against the Ugandan government, to kill or be killed. It’s time for this evil to end. Forgiveness or revenge? Peace or hate? Flowers or stones? Healing can’t begin when there’s so much pain. Broken people can’t mend shattered lives. ​and in the most unlikely times. ​now available as an ebook on Amazon! Write a review on Amazon, Goodreads, or Chapters and have an awesome photo dedicated to you on facebook!